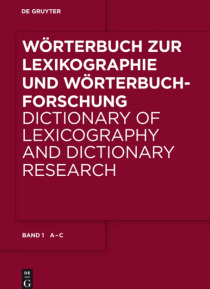 This four-volume dictionary is the first to register the specialist terminology of dictionary research in about 5,600 headwords, 7,200 reference headwords and 50,000 headword equivalents in nine languages, and thus forms the foundation for future lexicography. It is aimed at academics, students and translators and is intended as an aid both to reading and to composing and translating specialist… texts. Apart from an introduction to the subject in both English and German, it provides bilingual definitions and contexts together with multilingual translations of the headwords.